Soul Purification Rituals include offerings made from fresh coconut leaves which act as a symbol of gratitude to the Gods. 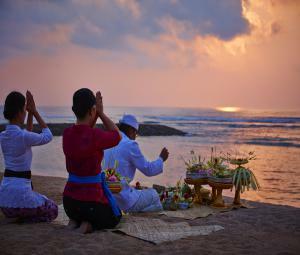 NUSA DUA, BALI, INDONESIA, November 6, 2018 /EINPresswire.com/ -- Located on the southern tip of Bali in Nusa Dua, The Ritz-Carlton, Bali is offering guests the chance to participate in an authentic Balinese ritual, Soul Purification. Expanding its menu of unique, locally-inspired activities, this Bali beachfront resort provides guests the opportunity to experience this time-honored tradition of the Hindu-Balinese culture and take part in a one-of-a-kind spiritual experience. Traditionally referred to as "Melukat," derived from the word ‘Lukat’ which means to purify in Balinese, the Soul Purification practice is centered around holy water – an agent of the power of God – which can cleanse spiritual impurities, and render the recipient immune to the attacks of negative influences. 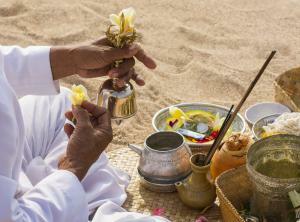 This spiritual activity is often performed when a Balinese native is about to enter a new phase in their life, is recovering from sickness, or celebrating either one of “Rites of Passage,” such as marriage or child birth, and the holy water is used to purify and cleanse the body, mind, and soul. 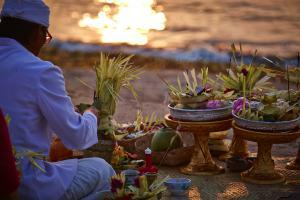 You may view the Soul Purification ritual here and follow the resort on social media. 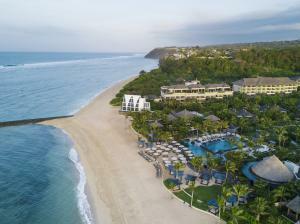 Located on a stunning beachfront combining with a dramatic clifftop setting, The Ritz-Carlton, Bali is a luxurious resort offering an elegant tropical ambience. Featuring tranquil views over the azure waters of the Indian Ocean the resort has 279 spacious suites and 34 best villas in Bali, providing the sheerest of contemporary Balinese luxury. Along the foreshore are The Ritz-Carlton Club®, six stylish dining venues, an indulgent and exotic marine-inspired Spa, and fun, recreational activities for children of all ages at Ritz Kids. A glamorous beachfront wedding chapel, makes an idyllic setting for destination weddings, while a range of outdoor event venues and extravagant spaces provide the perfect scene for celebratory events and wedding reception in Bali. Well-appointed conference venues, luxurious meeting spaces, customizable residential packages and experienced organizers also entice those looking to create inspired MICE Tourism events in Bali. Whether work, pleasure or romance is on the agenda, The Ritz-Carlton, Bali is the place to make memories that last a lifetime. Follow us on Facebook, Instagram, Twitter, Youtube, LinkedIn.